The Encore NZ3B Nancy Zeltsman "Medium Hard" mallets are the most versatile mallets in the line. They sound excellent in all registers, particularly the middle of the instrument (from about C3 to C6). As a side note, NZ3's are especially valuable to have in your collection at different levels of wear. An old NZ3 is essentially an "NZ2.5"! Birch Handles. One unique characteristic of my line is that the oval-shape of the mallet head is horizontal rather than vertical. I imagine (and maybe it's true) that the width of the mallet activates more of the vertical grains of wood in every bar-thus contributing to a richer tone. Everything about the construction of my line of mallets-from the cores, to the latex, to the type of yarn-is aimed at helping you to produce a fundamental-rich tone. I'm giving a 4/5 because I don't feel like these mallets are quite as versatile as they say. 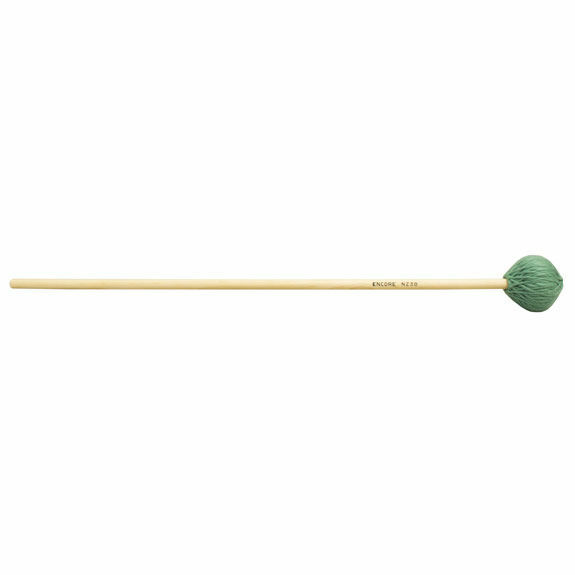 They're great mallets, but when you're going to be playing towards the upper end of the marimba, the 2B's will get you a similar timbre and everything great about this mallet, and it will speak better. I use these mallets for two mallet playing if I'm generally in the mid to mid-low range of the marimba. These also speak fairly well on the bottom end of 5-Octave marimbas without too many overtones covering the fundamental. Also, in chorale playing, one of these on the bottom end, or two of these for the bass and tenor voices work well, however I usually use harder mallets in the top end to help melodies project. Overall, these are great mallets! I have two pairs of these, one pair of the 4B's, one pair of the 2B's, and one pair of the 1B's and it covers most of the bases, Whenever I need something totally different I have a few others I throw in that aren't part of the NZ series, but I wouldn't use this mallet as a standalone.